One of our neighbors, the same one who told us she had been looking in our windows, has wooden geese that she decorates for various holidays and events. 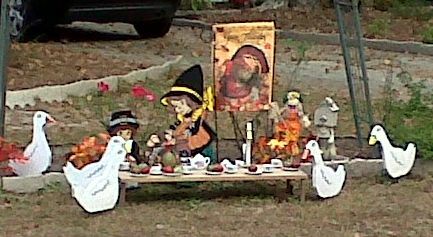 I used to just think it was tacky, but it has become somewhat endearing as the “welcome” to the neighborhood since her is the first yard you see when you come in. And now I miss the geese when they are packed away and wait to see how they will re-emerge. I thought it was just too funny not to share, so I will be sharing the holigeese with you throughout the year. I still think it’s tacky. Roommate! I was looking thru a Miles Kimball catalog (never heard of it before then)at my in-laws house and they sell costumes for fake geese. Must be your neighbor’s fav. Unreal. And weird. Happy New Year! Can’t wait to turn 30 so that we can have another reunion.